For a long time now, Africa’s political landscape has been wracked by violence. In recent years, however, a more positive force has risen in response to that violence: popular protest. Countries throughout the continent, from Tunisia and Egypt to Uganda and Senegal, have witnessed uprisings by a wide variety of people—the young, the unemployed, organized laborers, civil society activists, writers, artists, and religious groups. What is driving this massive wave of popular protest in Africa? Drawing on interviews with activists across a number of countries, Adam Branch and Zachariah Mampilly offer a penetrating assessment of contemporary African protests, situating current popular activism within a broader historical and continental context. 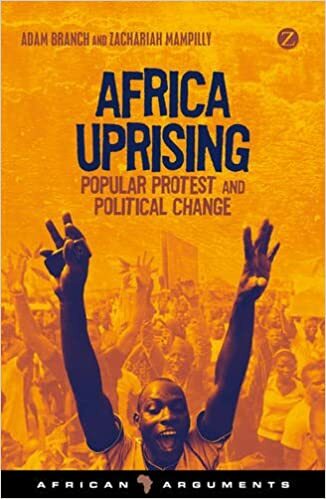 The first book to put contemporary popular protest in a pan-African context, Africa Uprising critically examines Africa’s incorporation into the global economy, the failure of African governments to democratize, the behavior of opposition forces, and the role of African popular culture in the movements. In doing so, the authors provide essential research and insight for understanding African politics at this key juncture in history.